In this two-session cooking camp, jr. chefs will learn a few new culinary tips and techniques while having fun with Chef Mia Wiggers. The class is limited to 8 students for the maximum hands-on experience. Click HERE for more info and to register. 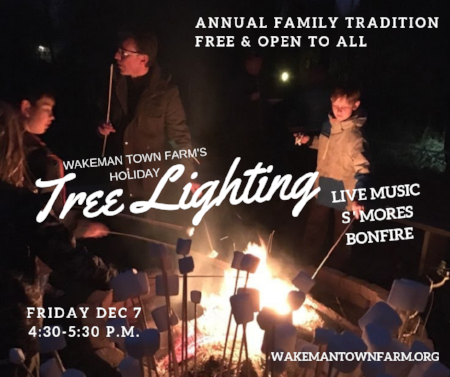 Westport's Wakeman Town Farm's Tree Lighting has local soul. The farm committee brings in student singers and musicians from our local elementary schools to provide festive holiday music. This year, Broadway actress Susan Terry will sing a few holiday tunes and lead a festive sing-a-long. Volunteers pour hot cocoa and serve cookies and stoke up the bonfire for s'mores. As the sun goes down, the team lights the Tree, a tradition for three generations of the Wakeman family. Date is Fri. Dec. 7, starting at 4:30 p.m. Free and open to the public! Come one, come all to this wonderful community event! 134 Cross Highway, Westport.